NOTES: This first version of Sgt. Slaughter was ordered through the mail and should not be confused with a similar version two that came the following year. An easy way to quickly recognize this version is the USA logo on his chest. Sgt. 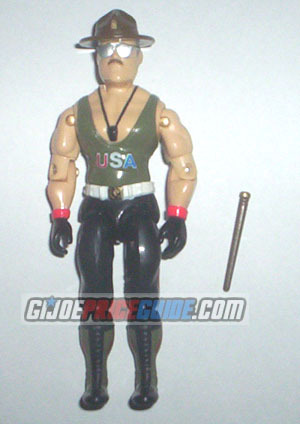 Slaughter has a wonderful overall paint job that you will want to check, including a GI Joe logo on his right leg and sergeant insignias on his wrestling style boots. Note any damage to his silver sunglasses as well. I'd also like to mention that the Sarge is considerably taller than most other 3 3/4 inch figures.